Lothlorien, the home in Middle Earth for the High Elves, is one of the places that I visualise very strongly, and also where the film version best matches my vision. But I’ve really picked Lothlorien for my world-building trek through the alphabet this April, as it gives me the option to talk all things world-building in Lord of the Rings. The more I think about world-building during this blogging challenge, the more I appreciate the lengths to which some authors have gone to create a vivid, whole world. When I first took the Princelings of the East to publishers, I was proud to say what a detailed world I’d built, but really, the longer I spent with it, the more I discovered about it. I’m still discovering things about it as I write book 7, but that’s partly because I’m going to places I knew of, but didn’t think I’d need. I wonder to what extent Tolkien built things into his world because he wanted them as part of a narrative, or because they needed to be there. Were his veiled references to other battles and events in The Hobbit the spur to go and write LOTR? Did he start with Numenor (Appendix A in LOTR ROTK), or did that come afterwards? These days I expect somebody has done a three-year doctorate on Tolkien’s work, or there are plenty of academic examinations, if only I bothered to look! I avoid analysis of works such as these because I don’t want to spoil the magic. When I interviewed authors for some of the other posts this month, I asked which aspects of world-building they felt were more important, offering them physical/geographical/environmental, social, technological, political and cultural aspects. Here we are, halfway through the alphabet, and I’m thinking, they are all as important as each other, although some worlds will be richer (or stronger) in one or more elements than others. But it does depend on the author’s focus. With LOTR, I can think of each of these aspects, and could probably do an essay on them if I was so inclined. Physical – geographical; the maps say it all, really, the land moulded the people and the people moulded the land. Some spaces are metaphors for culture and personality of the people within them: the Shire – homely in the comfortable sense; Lothlorien, calm, elegaic, otherworldly “like being at home and on a holiday all at once” as Sam says (FOTR Bk 2 Ch 7); Moria – polluted and stinking, the very embodiment of evil. Social: surely not much needs to be said about the relationships between races, the social structure within the different races, leadership, the way people live – especially in the Shire, Edoras and Minas Tirith. But the language elements! Fully formed dwarvish, high elven, rune-script, the language of Mordor… of course Tolkien was a scholar, and unlike most of us, he developed this huge work over years of his life. Technological; not only the machine technology but the know-how that enables people to do things – like the Rings of Power, or the knowledge of wizards, as well as the wondrous machines that Sauron or his deputy drive forward in battles. Political: what more politics could be involved than getting the free men to work together? The Two Towers in particular is a hotbed of political intrigue. The elves manoeuvre among themselves, with their different factions wrangling over everything – especially the mortals. Cultural: the combination of high culture, in myths and legends of this world, from Numenoreans, Isildur’s Bane, the Silmarillion through to the dwarf legends, and ‘lesser’ cultural aspects, such as song and poetry, from the Tale of Tinuviel to Sam poems, all displayed for us within the text or as appendices and spinoff books… it makes me want to give up writing. I am not attempting a LOTR. But the longer I write my series the more I value these aspects; the history of the world, and the beliefs people have and how these beliefs run in parallel or conflict, start to intrigue me. When I brought a person into my books who lived by telling stories (Willoughby the Narrator), I started to build some cultural background. It was fascinating – and scary. But no, I am not putting poems in my books. I’ll leave that to geniuses like J R R Tolkien. Do you have a favourite aspect of the Lord of the Rings books? What brings it all to life for you? 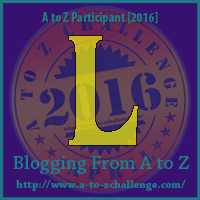 Don’t forget to enter my AtoZ Giveaway – running all month – see entry for top right. One of the things I love of about Lord of the Rings is the world building, especially the language created for it. I’m creative as it is, but imagining crafting an entire world, history, and language is something I can’t imagine doing. Ah good – you’ve read much more widely than me! One of the things I love about Lord of the Rings is that I can’t pick a favorite aspect. I think that’s true for most great books. There is just so much amazing creativity and the story itself blows me away. My reading is always character driven, so for me the world building is important to give the characters their motivations and context. For Lord of the Rings I love the way the races differ and how they think of things differently, coming together in the Fellowship to compliment each other. The best book written in English of that century, In my opinion anyway – I first read it about 56 years ago – I have re-read it maybe thirty times – have it in paperback, hardback, deluxe (bible thin pages and leather covers) the Radio recording on cassettes, the audio version and the DVD (the film was okay but wrecked the ending so count that as a nil) as you can see that was a world I fell into and pack my bags at reg, intervals to have a re-visit with old friends.